Drying with the excalibur now and I have the same complaint. I only have the 5 tray and size and noise are my issues. This solar dryer looks great! Can’t wait to hear more at the Heritage Harvest Festival! Sometimes we might think a method or process is not for us, but it is really the tools we are using that are what’s holding us back. That, and those blocks we throw up in our minds. Although the SW dryer holds less that my Excaliber, I used it so much more. You could expand on the capacity by building a second one of that size (as Fodor suggests) or building one with a larger window. The larger it gets, however, the less portable it is, if that’s important to you. Anyway, dehydrating with the sun, rather than electricity, has became a lot more interesting. Dehydrated okra is one of our mainstays. It is easy to throw some in a soup during the winter. I grow Burmese okra (southern exposure seed exchange) and it is not as “slimy” as other varieties so it dries well. Also, the pods can get large , but still stays tender. 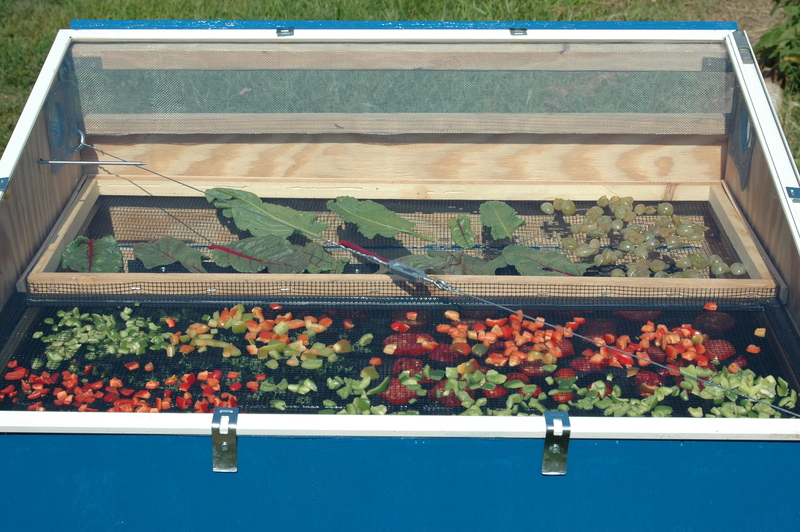 Has anyone tried using a greenhouse to dehydrate veggies? I’m growing okra for the first time this year because I thought it would be good to put in the dryer. I’ve heard of people hangning their onions and garlic in the greenhouse to dry. Dehydrating – which dries a food more or less completely – depends on a good flow of fresh air to remove relative humidity from the area where the dryer is in operation. I suspect that unless the greenhouse can be open and still retain the level of heat desired, there will be problems after the air has a chance to stagnate inside the greenhouse slightly. The dryer will eventually be “breathing its own air” and the drying effect will slow down or stop working…even though the drying was still flowing air. This potentially invites problems like mold. With all this in mind, I think it would be worth trying! You are right. For the example I gave of the onions and garlic, it would be more correct to say they were cured there. They would have been put there whole. Although, I’ve heard of people putting cut vegetables in their greenhouse to dry, I wouldn’t do that for the fear of contamination from whatever is in the air with exposure to the soil and non-sanitary surfaces. Cindy and Matt, thanks for the replies. Matt, I don’t really care what the name is. BTU, kWh because as you wrote all that counts is the heating power. The peak output power is just part of the puzzle. 120+F air would be a great temp *if* the volume is high enough. I need many gallons air to heat my house. So I need to know temperature plus gallons/h. That would be a good start. Then I need to know the average performance over a whole day. To make this project worthwhile I need a large volume of hot air over an extended period. Strange I got a comment in my email from this thread that’s not on the website. I would have replied……strange. Seems several comments are lacking the Reply function now too. WordPress bug or something going on? Thanks from Northern Virginia!! You’ll notice that a comment on the actual post will have a reply button, as will a comment on that comment. The reply button doesn’t show up on further comments on comments. I suppose that is to keep things from going too far off base from the original post. That was a really interesting post – thanks. I have Fodor’s book and have ordered some screens from him as well, but haven’t had the time to build one yet. I really want to start dehydrating and have almost bought the Excalibur several times, but I keep holding off because I’d rather have a solar powered one! But, I think you’re right, the important thing is to just start dehydrating… regardless of the method initially. The Excalibur could always serve as a great back up down the road. I am excited about what you have done already…and ready to do more research myself! I have requested the Fodor book from the library. I am very short on time, so the idea of loading the dryer on a sunny morning and checking it after my day at work sounds GREAT. My crew would certainly eat dried tomatoes and peppers. BABY STEPS. Suzanne, glad to have you with us on this adventure. Before I bought Fodor’s book to use to make my dryer, I borrowed it from the library to see if it was going to be useful to me. There’s more information about using these dryers at https://homeplaceearth.wordpress.com/2011/11/29/solar-food-dryers-update/. Finishing up the appalachian solar dehydrator now, and I am really excited to get it working! Fruit is starting to come in where we live, and we’re just in time! Luckily, I’m a carpenter, and have salvaged most of the materials free. We live in sunny colorado, and are excited to see the speed at which we can dry. Beau, so glad you’ve made a dryer. You’ll find yourself walking around the garden each morning trying to find something to put in it, just because it’s there. what material is the mesh made from? The screening material is polypropylene. More info at http://solarfooddryer.com/Info/About_SunScreens.htm. Joan, keep us posted on how your solar dryer works for you. It’s really awesome to see others who are walking the talk! I offer lots of plans on solar food dehydrators and one important piece of feedback I have gotten is from the very health conscious wanting stainless steel screens. 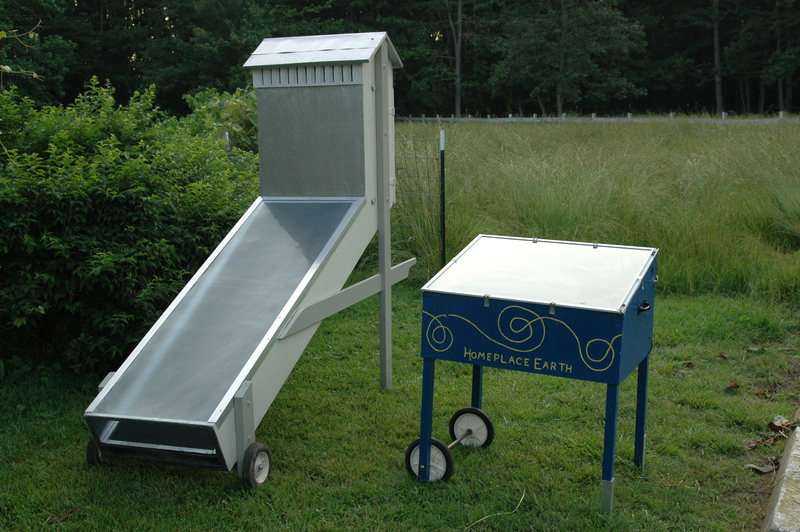 If you are interested in where to find stainless steel screen for your solar food dehydrators just shoot me an email. Have you ever thought about selling them? I did notice there are a few industrious individuals who seem to be doing quite well offering their custom solar food dehydrators on eBay. Anyway – very cool and thanks for sharing. 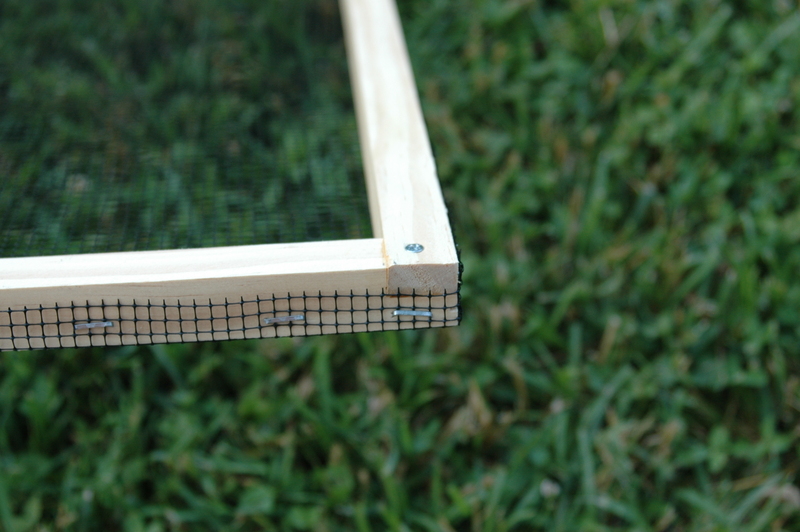 Scott, I haven’t felt the need for stainless steel screens, but others might be interested. I want folks to make their own solar dryers and learn along the way, leaving me free for other projects. I measured how long it took my Excalibur 5-tray to dehydrate a load of seedles grapes into raisins with a KillAWatt meter. It took me 6.2 killowatt-hours – or about $0.62! If your power is around $0.10/kw-h like it is here in Virginia, you should see similar results. They were done in about a day to a day and a half depending how big the grape was. I did not slice open the grapes. FWIW, this thing could be run outside (or in a garage) to ameliorate the noise and humidity issues…and with the low power use – it alternates off/on…throughout its heating cycle – it seems like it should be able to run off of solar pretty easily. Just some thoughts until I get around setting up my own solar dryer! Thanks for the great article and resource links! Matt, that’s interesting. I don’t know much about solar, but it would be good if it could be powered by the sun. My old 9-tray Excalibur took a hefty 1000 watts. I see from the Excalibur website that the new 9-tray models use 600 watts and the 5-tray uses 440 watts. The mfgr pretty much always posts than maximum possible power usage. On the “Fruit” setting, in the drying cycle I posted about, mine cycled “on and off” between 256-watts and 12-watts. The Excalibur is adjustable, so if you were dehydrating at a lower-temperature setting, peak power-usage would be proportionally lower. Next time I have it out ‘ll have to look at what the peak is for the lowest temperature setting. Unless you’re dehydrating something like meat that requires higher temperatures (and short times) for safety….using a lower-than-usual setting is fine, it just extends the drying time. If one were trying to power this via PV solar, I think it could be made to work for “most foods” without going to any extremes. Cindy, can you please share something about the performance of the various dryers? Does a certain type work under less optimal conditions like less sun or a non optimal angle of the sun? Cloudy days certainly slow things down. No doubt about it, you need the sun, unless you utilize the electric option for the SunWorks dryer.The SunWorks dryer seems to get things done a little faster. I have not experimented with different angles, but I’m sure you could try moving it to maximize your efforts. I just put things in and take them out when they are dry. I like the ASU dryer because it holds more and the sun doesn’t shine on the food. Each has its own advantages. Ok, thanks for your answer. I was thinking about a variation on the ASU type of dryer. Identical but a detachable solar collector that would use to heat my house in the winter months. I’ve seen many builds and tests, but they are mostly done during summer months in the hotter states. I want to use it during the winter months in Indiana. Test results usually are: Works good, gets quite hot etc. While I very much appreciate people even taking the time posting their tests on a blog the only number that’s workable (for me) is BTU/h. Impossible to measure, without equipment, but still a very useful number because it gives a “scientific way” to compare performance of dehydrators, solar ovens, heat collectors and all sorts of earth friendly devices which quite often are compared to (the BTU of) conventional heating like gas and electric stoves. If you have an article discussing those things, please point me to it. Tony, I don’t know of any articles, other than the ones with the directions for the ASU dryer that have done any measurements. You are probably familiar the the Heat Grabber from the Mother Earth News Article from the 1970s. Mother Earth News sells the updated plans through their online bookstore. You could attach a food dryer unit to it in the summer, as long as you could vent the heat away from the house when it is not needed. It might not be precisely the data you are looking for, but what would be wrong with knowing the peak output temperature of the design instead of BTUs? This would be easy data to obtain! Measuring performance with and without forced air would probably also give useful info. I understand why you want BTU’s, but trying to “speak in BTU” seems unnecessary and limiting at least in terms of evaluating initial designs. Unless you pick an expensive design to make, you can always scale up from whatever you build first. If you really want to implement an expensive (or hard to make) design, then it could make sense to try harder to measure something like “heating power” in BTU’s….but I’m not sure that even the HVAC mfgrs are actually “measuring” the BTU output of their HVAC’s….I’m pretty sure they are estimating – or calculating – based on power usage by using known conversion factors. But it’s possible (with a little ingenuity) if you can sufficiently direct the output of your heater that you could make it raise 1 pound of water 1ºC and time how long it takes. That’s the time it takes to “make one BTU”. Make sure to read all my posts of solar food dryers, since each dwells on something different. If you are drying mushrooms, you want the sun shining on them to produce Vitamin D. If you are drying greens, it would be an advantage to not having direct rays. They both work well. The Fodor dryer probably dries just a little faster. If you have more money than time and talent, go for the kit. Even if you are building it from scratch, the Fodor dryer is easier to make and takes up less space.